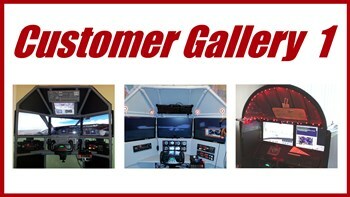 Customer Gallery 2 features more for your home flight simulator setup: helicopter collectives, keyboard mods, compact roll-away flight sims and more. 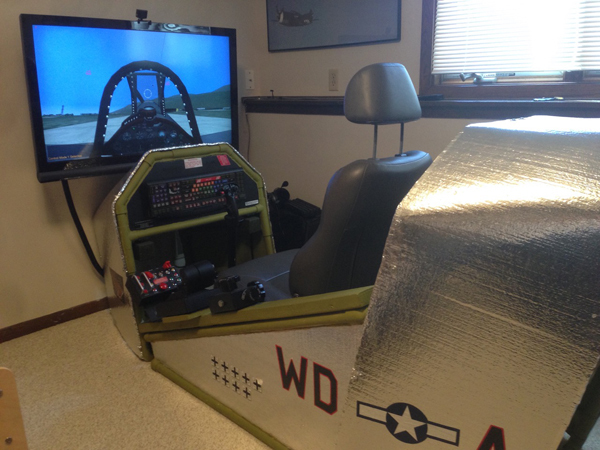 Everything you see here was built by customers using my DIY Flight Sims videos and manuals. 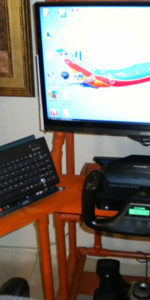 Notice in many cases the builders included different components to match their needs and resources. Look at what Dan built! Not only did he modify the DIY Roll-Away Flight Sim project to include both a yoke and a joystick, but he did it in record time, and look at all those Saitek switch panels ! ! ! Dan says, "Thanks so much for the awesome directions. The instructions were easy to follow and the videos made it easy. 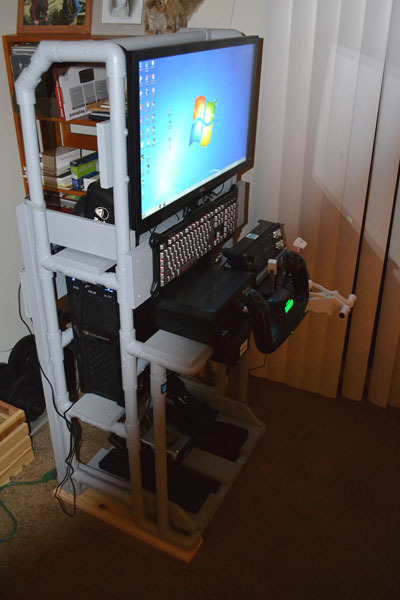 I modified the design to house all my hardware and allow me to switch from rotary to fixed wing. 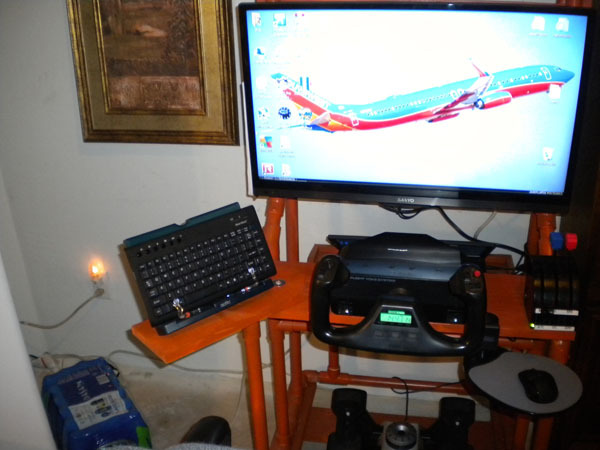 I use my laptop to run X-Plane so I didn’t need the computer shelf, and my audio plays through my display. I’m going to build your collective next!!!" Wow, Dan ! Double Wow. Glad you enjoyed the project and thanks for the pictures. Wait, what is that? Aluminum? No, it's simply PVC pipe painted silver! 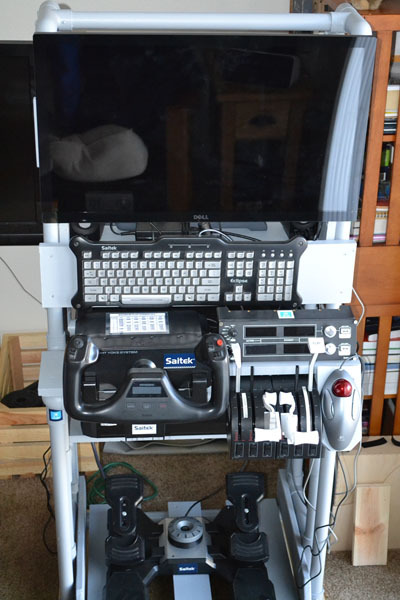 Craig modified the DIY Floor Unit with Center Joystick so it can switch between a side joystick and center joystick set up. 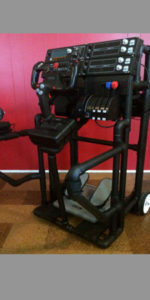 Note the clever D-rings fasteners on the base of the joystick stand. He says, "PVC is easy to work with and can be made to look great. Anyone can do it." 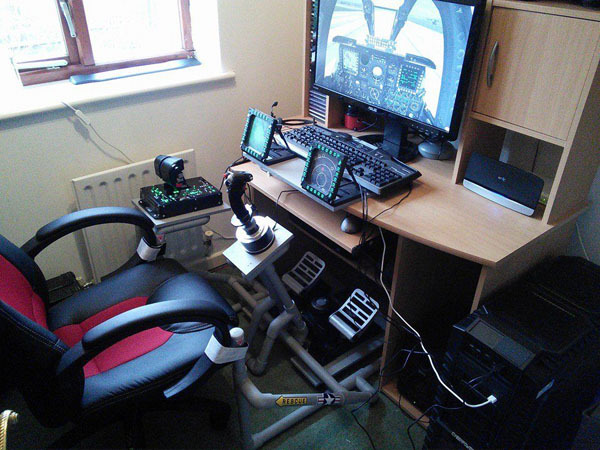 Totally agree, Craig, this home flight simulator setup looks amazing! Thanks for sending in the pictures! Gary did excellent work with item #E420. 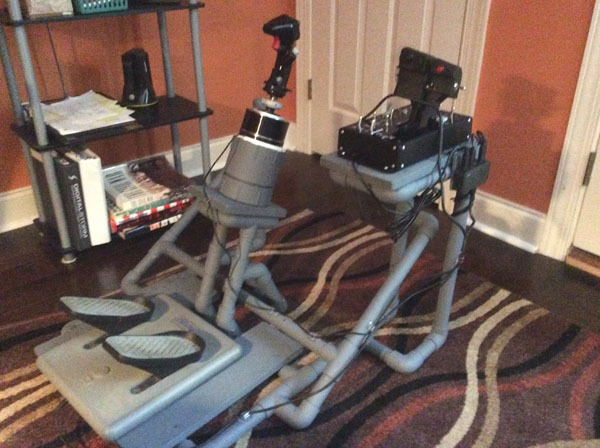 He built the version that is detailed in the "DIY Roll-Away Flight Sim with Airplane Yoke" instruction manual. 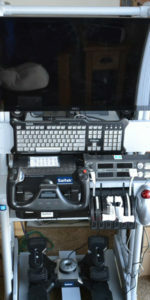 Note the extension for the trackball mouse and the additional platform for the Saitek radio panel. 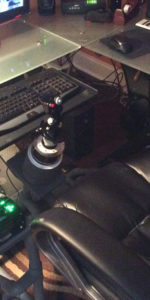 And check out those handle extensions for his Saitek throttle quadrant, very nice! Delightful, Gary! Thank you for the pics! 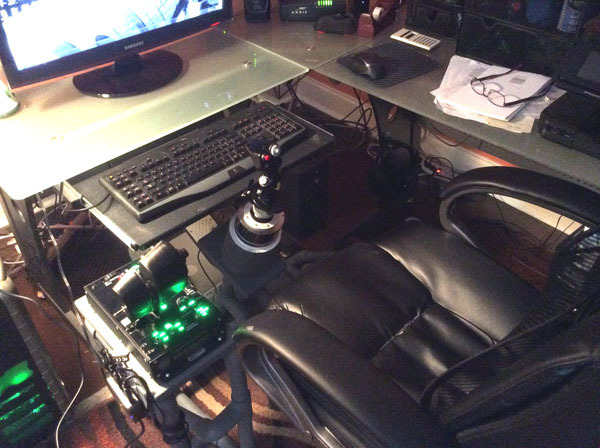 Ron built a #F321 Center Joystick Frame and modified it to accommodate a Thrustmaster Warthog joystick and throttle. 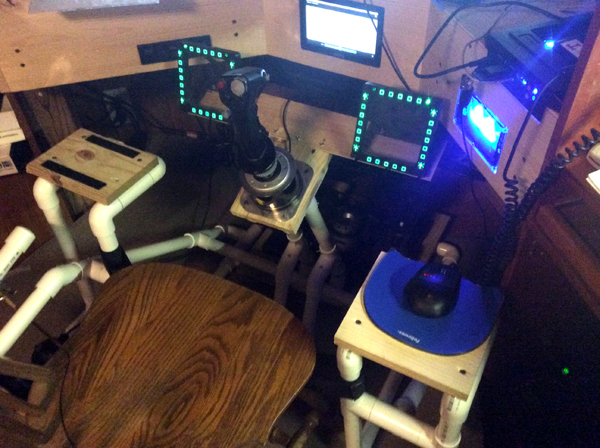 He writes, "Built a center joystick configuration, but replaced my CH Combat Stick and Pro Throttle with the Warthog HOTAS. Modified the build to remove the baseplate from the control stick (got in the way) and replaced the 10” PVC pipes on the center stand with 5 ½ “ pipes. Then added 4” PVC plug (male & female portions) to mount the stick in. Worked out great! 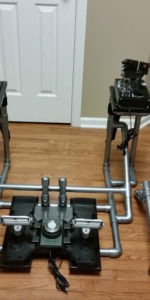 Also lengthened the Throttle stand to accommodate the larger throttle base. 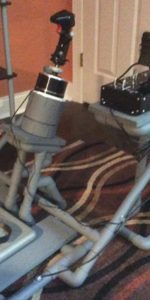 Would be better to add a support under the forward end of the throttle stand, but that may be another day. Very good product with easy to follow instructions." 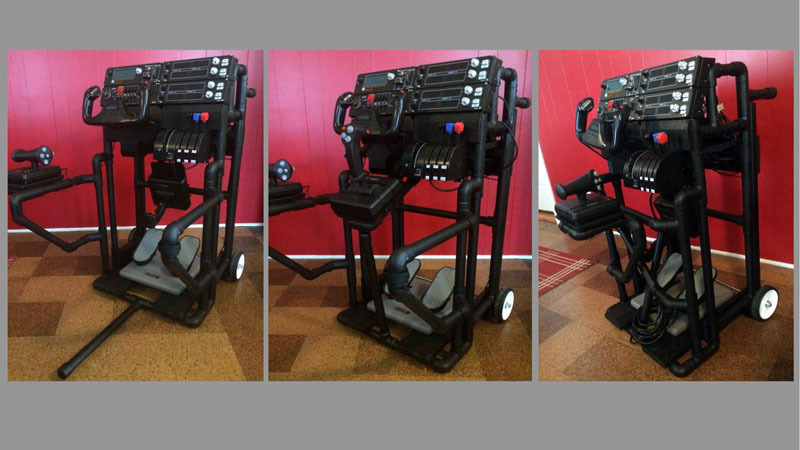 Great job with incorporating the Thrustmaster Warthog! Thanks for sending the pictures! 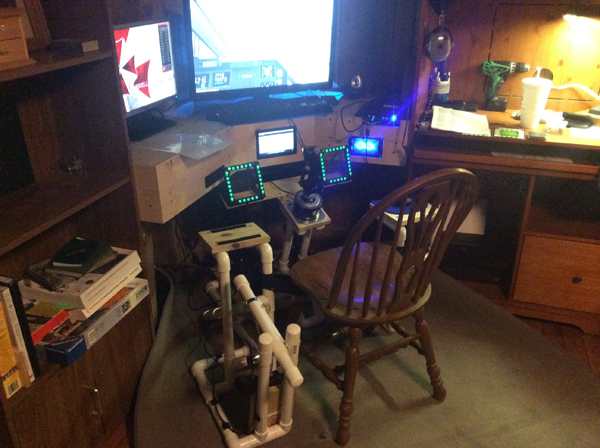 Rob built a DIY Roll-Away Flight Sim project and made several impressive modifications. 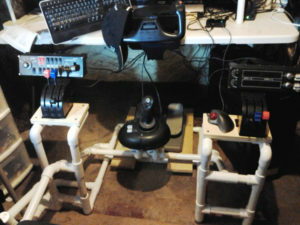 "I built the flat skid using 2x4s and 1x8s,spaced at a distance to allow mounting the Saitek Pro-Flight pedals. 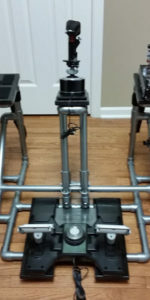 Castors are 3" with locking casters in the front. The rest of the frame is standard Sch 40 PVC pipe, tied in with 1x4, 1x6 and 1x8 shelves and upright components...To me it is a clean design that I can literally roll into a closet when not in use. (although I can't imagine when that would be, hehe)"
I agree! Thanks for sending the pics and have fun with your project ! 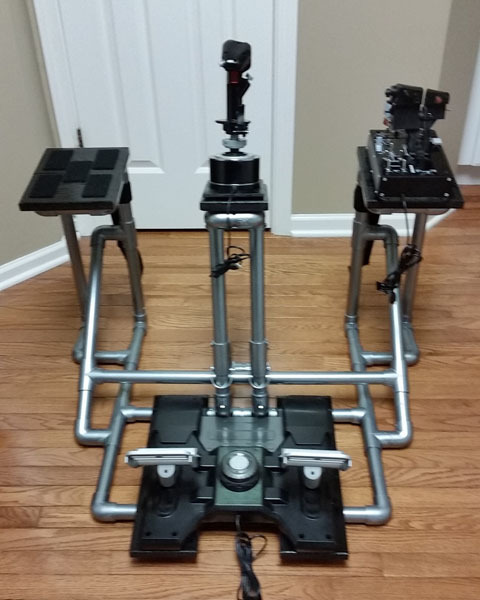 Wayne build a #F321 Center Joystick Frame for his home flight simulator setup. 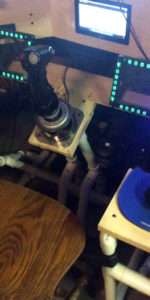 He also modified it to fit the Thrustmaster Warthog Joystick HOTAS. 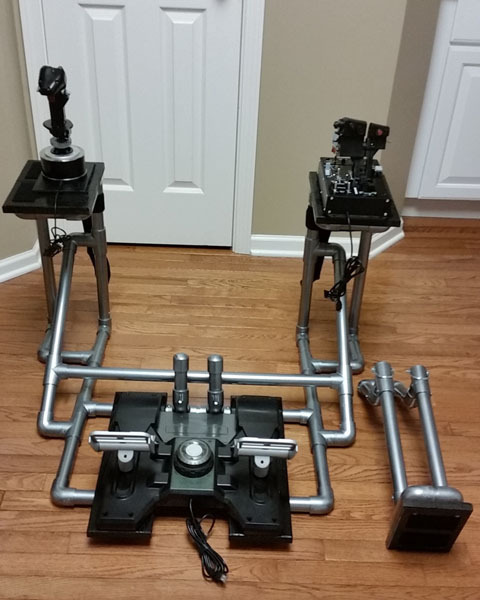 Furthermore, he included some attractive Saitek rudder pedals. He writes, "My A-10 cockpit, Cheers. P.S. It took a bit of searching to find the pipes here in the UK. I found a company called Plastic Pipe Shop Ltd but had to buy 18 meters of the stuff because apparently people are using it to make weapons." People are using PVC as weapons? Wow! 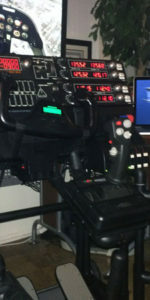 My customer, Robert, modified the F331 DIY Easy Helicopter Collective and now it can do some of everything. 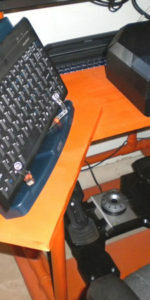 Notice the additional stand on the right side with space for a trackball mouse. Very clever! Thank you for sending your picture, Robert. 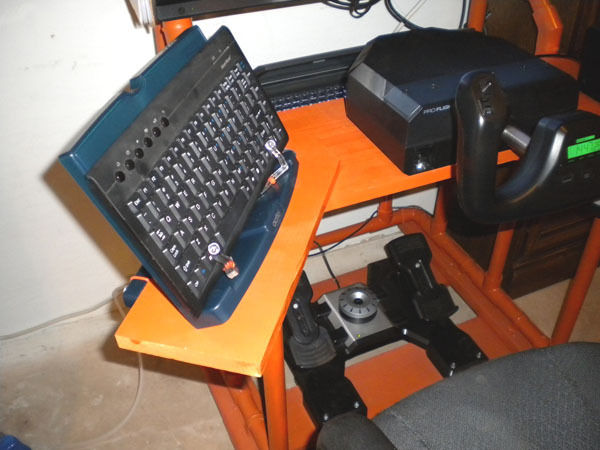 Michael built the best WWII (IL-2) Fighter Keyboard Modification I've ever seen. 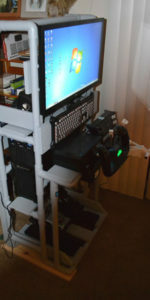 He attached it to a custom desktop frame and added the Logitech G940 Joystick and Throttle combo. He even added gauges. 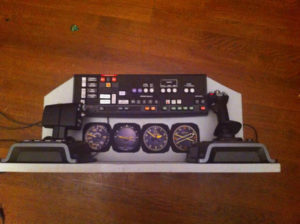 From Michael: "Just wanted to send you a photo of my new IL-2 Dashboard. I popped off the extra keys, and put a little panel over the empty spaces... It's pretty boss." Joshua added some amazing things to the F331 DIY Easy Helicopter Collective including a touch screen! 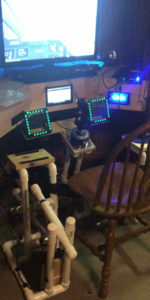 He writes, " The GPS is the Reality XP simulating the Garmin 530 and it works amazing on the little touch screen especially for setting up gas stops and multiple airports. 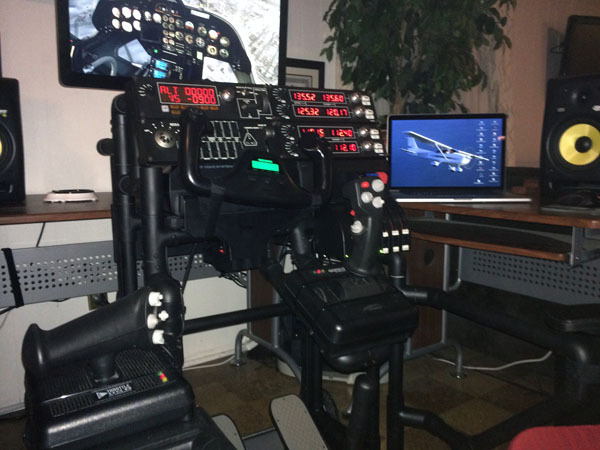 I use a program called ForeFlight on my ipad as well so that I have moving charts so all in all the setup is close to what I use when I fly for real." This is a fine rendition of the E410 Portable Air Combats Simulator (PACS). Micah says: "I'm a long time fan. It looks like you don't sell the PACS any more, but my family has loved it. My 3 kids all play on it when Dad isn't playing. Countless guests have oohed and ahhed about it (and yes, half thought I was nuts :). Thank very much for having the ideas, and putting them out there!" Beautiful simulator! Great work, Micah ! 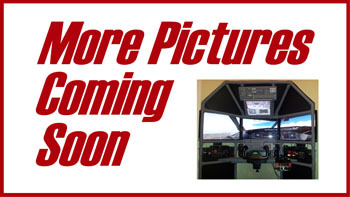 I have over 90 pictures of customer projects to upload. I am currently going through the laborious process of optimizing them for the website. Check back soon.